If you are a Star Trek fan you will certainly remember the Borg (or is it one of the Borg?) 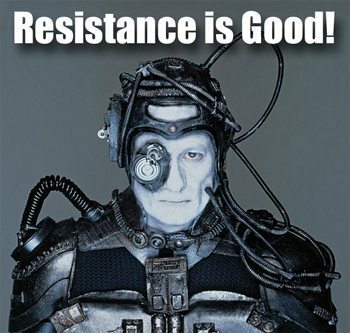 utter the unforgettable quote, “Resistance Is Futile”. Resistance used in that context was certainly not good. Resisting would most likely get a person hurt or even worse (use your imagination). However….in this context, Resistance Is Good! We see so many of the top professional golfers now spending a great amount of time in the gym lifting weights, using bands and even using body weight exercises to build muscle and develop more “golf strength“. The only way to develop more powerful muscles is to use resistance. So, in this context Resistance Is Good! We have spent many years developing swing training devices that are based totally on resistance. Using resistance while performing a golf swing motion (or movement pattern) is the only way to develop those exact muscles used in the golf swing. As Captain Jack Ross (Kevin Bacon) said in his opening statement in the movie A Few Good Men, “These Are The Facts Of The Case, And They Are Indisputable”. In the video below, I am demonstrating what I mean by resistance being good. The resistance tubing used on the GolfGym PowerSWING Plus is light, but because most golfers don’t use the golf specific muscles for any other activity, they are generally weaker than the arms. If you want to gain more power and speed in your golf swing, while developing consistency, you must do exercises and movements that encourage and affect the muscles in a positive manner. The bottom line is: If you want to swing your golf club more consistently, with more power and speed, you are going to have to do some resistance training. The great this is…with the PowerSwing Trainer or PowerSWING Plus all you have to do is swing! ← Jason Day’s Winning Formula – S.F.T.